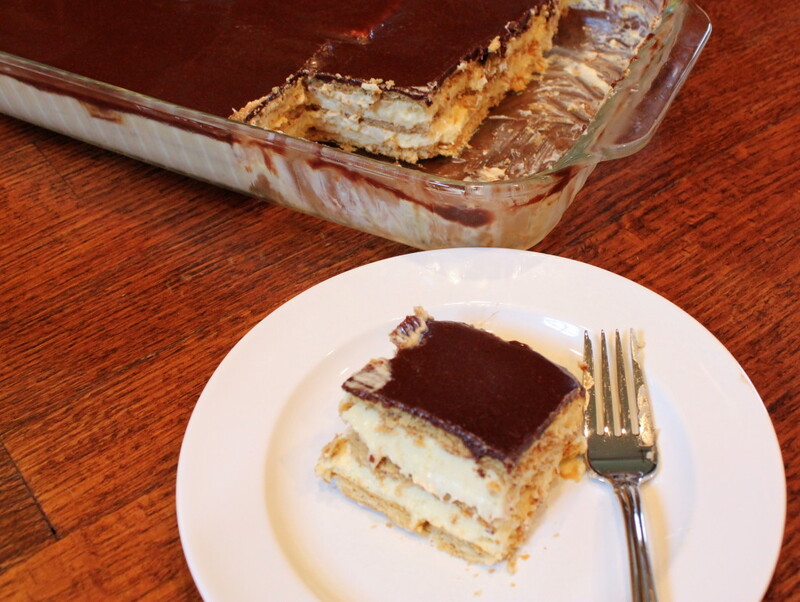 I had never heard of Chocolate Eclair Dessert before until I visited my aunt Jolene in Houston a few years ago. As soon as I took that first bite, I knew this would be a recipe that I would frequently make. If you’re looking for a fancy-looking, comfort food-tasting, easy-to-make dessert for a crowd, this is a winner. Tonight we had life groups at our church and so I brought this, and the pan was gone by the time I got home in just a few hours! 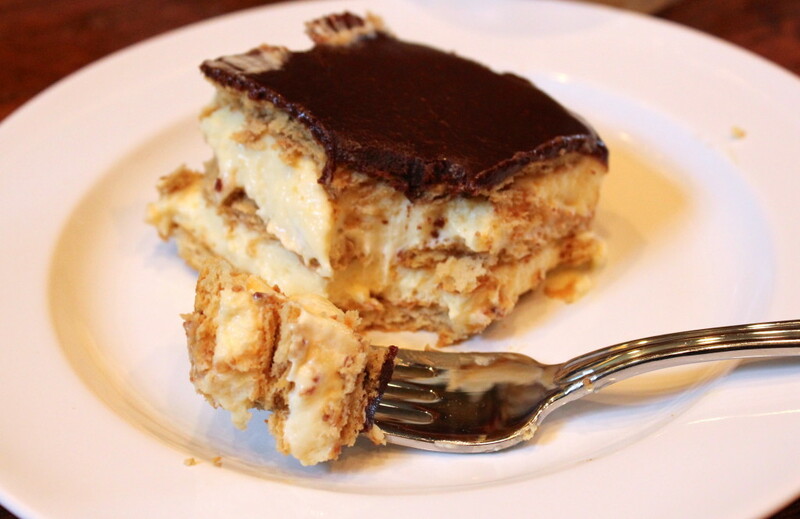 While the name, “chocolate eclair” sounds elegant, making this dish is not complex…it’s actually a NO-BAKE dessert! 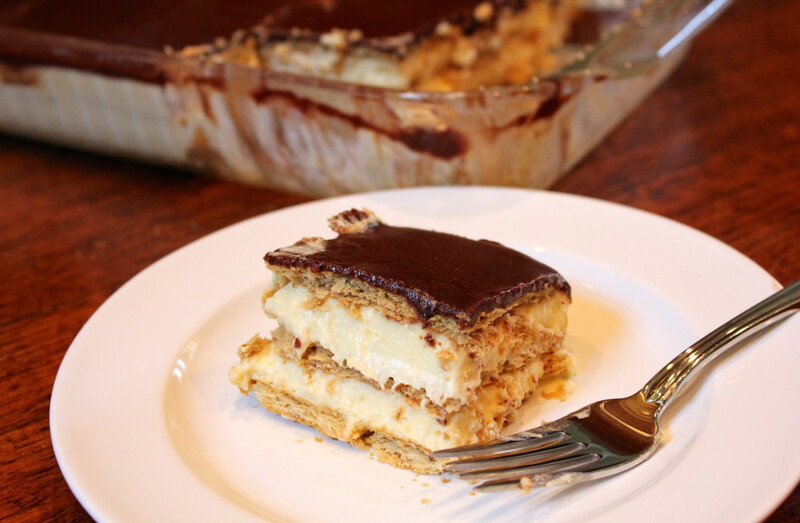 All you need are graham crackers, instant pudding mix, milk and cocoa to make this pretty, layered dessert. Word to the wise: make this a day before you actually plan on eating it. That is, if you can wait that long!!! Allowing it to sit in the refrigerator lets the graham crackers soften and absorb the pudding mixture. FOR THE FILLING: Combine pudding mix and 3 cups of milk; beat. Stir in Cool Whip. Place layer of graham crackers in the bottom of a 9 x 13-inch dish. Spread ½ of the pudding mixture over the graham crackers. Repeat with another layer of graham crackers and pudding; then top with a final layer of graham crackers. FOR THE TOPPING: Bring cocoa, ¼ cup milk and sugar to a full rolling boil; boil about 1 minute, stirring very frequently. Remove from heat and cool one minute. Add butter and vanilla; stir until butter is melted. Pour chocolate topping over the top layer of graham crackers. 3 Responses to "Chocolate Eclair Dessert"